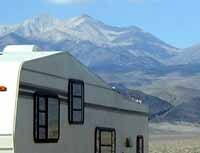 The two highest peaks in the picture are Montgomery Peak, CA (left) and Boundary Peak, NV (center). The low point near the right is the saddle which was the highest point I reached. Well, I didn't make it to the top of Boundary Peak, the highpoint of Nevada; it was too windy. I stopped at the ranger station in Bishop yesterday morning to get maps and information and was told a weather front was moving in. There would be gusty winds today, worse winds tomorrow (Thursday) and much colder weather after that. 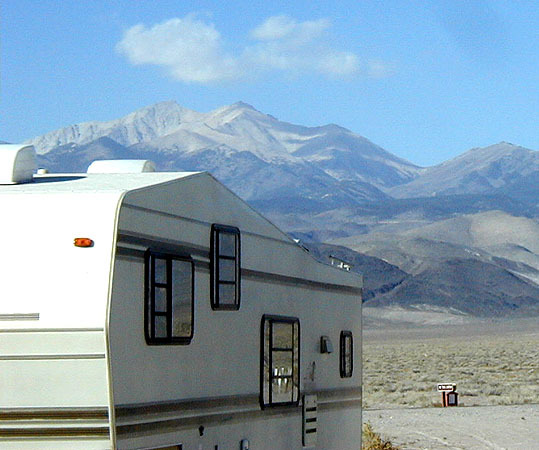 I drove into Nevada, over Mortgomery Pass, and to the point where the Boundary Peak access road leaves the highway, at about 5,500 feet elevation. I left the trailer there, and drove 8 miles up the 14.5 mile access road to check it out, then returned home in time to see the sun set over the peak. I'm really out in the middle of nowhere here near the intersection of Nevada highways 264 and 773. The nearest lights are about 5 miles to the south on the outskirts of Dyer, NV. Otherwise, conditions were perfect for star watching and the stars were beautiful last night. It was absolutely silent except when a truck went by, and that was infrequent. I can see highway 264 for several miles in each direction, so when a vehicle goes by at night, I can see it for about 10 minutes. I was up early this morning, and there was no wind outside. I drove the 14.5 miles to the trail head (at 9,000 feet), and started up the trail, heading into gusty winds out of the west. I was climbing the east side of the mountain, so when I reached a saddle at 10,800 the wind had its first clear shot at me and nearly blew me off the mountain. Too much wind. Time to reverse course. Let's call it a practice climb. When I started down with my back to the wind, it grabbed my backpack the turned me 90 degrees. A bit further down I found a sheltered spot, ate some of my lunch, and then hiked the rest of the way back to the trail head, The wind had picked up there as well. The dust kicked up by the truck on the way down would sometimes be blown past me and make it hard to see where I was going. The truck is now a uniform dust color. The flat desert near the trailer was full of tumbleweeds on the move. The trailer was buffeted by the wind which was very noisy. At one point I heard what I thought was another gust coming, except the noise increased rapidly to an extreme level. I expected the trailer to be blown over, but it turned out to be a jet fighter plane flying very low and very close. Because of the weather predictions, I plan to move out tomorrow morning. It doesn't sound like the weather will be good for at least 3 or 4 days, and then it will be November - it's getting late in the season for Boundary Peak. Maybe next year.